John Varvaots fragrance and perfume list. John Varvaots fragrances: by Elizabeth Arden. 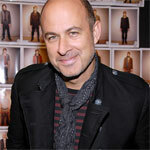 John Varvatos is an America high fashion menswear designer. His debut fragrance, John Varvatos was launched in 2004. Fall/Winter 2000 marked the debut of, an amazing men's lifestyle collection comprised of tailored John Varvatos clothing, John Varvatos accessories and John Varvatos shoes. John Varvatos has an eclectic point of view that pairs the luxurious with the casual, ultimately creating a look of easy elegance.